Every year the UK throws away 100 million tonnes of waste. That’s over 15 times the weight of the largest Egyptian pyramid, making for one great big pile of rubbish, and most of it ends up in landfill, buried underground in giant holes. Not only do landfills take up space that could be used for something else, but they also produce methane, a greenhouse gas that is 20 times stronger than carbon dioxide. We’ve simply got to cut back on all the waste we produce, and using maths and statistics will help us plan for a sustainable future. What is sustainability? The Earth has a limited amount of natural resources, so if we use them all up eventually they will run out. Recycling lets us use the same resources over and over again – and in some cases it can actually work out to be cheaper than using raw materials. For example, the aluminium we use to make fizzy drink cans and other containers is extracted from a rock called bauxite, which is mined out of the Earth’s crust. The extraction process uses a lot of energy and releases carbon dioxide, so making new aluminium is quite environmentally damaging. The goods news is that recycling aluminium uses much less energy – just 5% of what it takes to extract the metal from bauxite. Recycling aluminium is also very fast, which means a can you throw away today can be melted down and reused to make a new one in just six weeks. Do the sums and its obvious that recycling is not only good for the environment, but it can also make you money – companies like Alupro will pay cash for collections of aluminium cans! 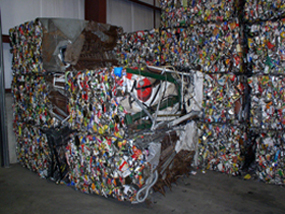 Unfortunately not all materials are recycled as well as aluminium. Making electronic gadgets like flat-screen TVs and mobile phones requires rare elements such as indium and tantalum, and they’re starting to run out. Some scientists believe we might not have any usable amounts of these elements left in as little as ten years. Does that mean we’ll have to say goodbye to iPods and video game consoles in the near future? Hopefully not. Statisticians can track world supplies of materials, and create models to predict future demand. 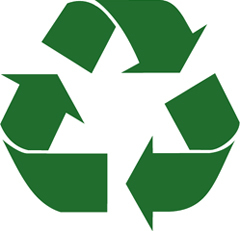 To help deal with the demand, mathematically skilled scientists and engineers can come up with new ways to recycle. And by understanding the maths behind recycling, we can all do our bit to reduce waste and greenhouse gases.